Guwahati, May 22 : This might make Count Dracula bat his eyelids in anxiety. Meghalaya governor Ranjit Shekhar Mooshahary, not known to have bats in his belfry, has batted for bat meat. His claim: the nocturnal flying mammal, often demonised as evil bloodthirsty vampires, is tasty and healthy. “The caves of Meghalaya have bats that can yield healthy meat rich in proteins,” Mooshahary said while releasing adventurist Bryan Daly Kharpran’s book Caves for the Uninitiated in Shillong on Monday. Advising the state government to go for bat-breeding, the governor cited the United Nations’ call for eating nutritious insects to justify bat meat consumption. “Bats eat only flowers and their meat is clean and delicious,” Mooshahary said. Animal rights activists panned the governor for getting his facts wrong and trying to promote an “illegal” meat industry. “Besides, bat meat is not a notified food item,” Goswami said, adding that encouraging people to eat ecologically sensitive bats useful for humans in plant pollination and pest control was not becoming of a governor. 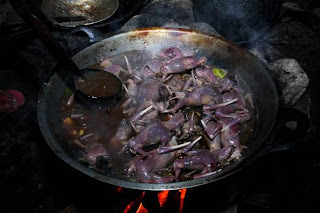 Bat meat is not popular among the tribes of the North-east although they eat a variety of animals, reptiles, birds and insects. 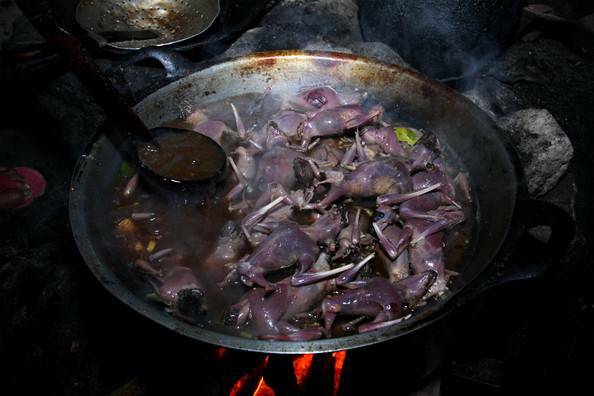 Bat meat is a craze in South-east Asian countries such as Indonesia. People there believe the bile of bats — the giant fruit bats in particular — cures asthma and other respiratory diseases. India has 117 of the 1,116 species of bats (Chiroptera) identified so far across the globe. More than a quarter of these are found in caves in the North-east. Meghalaya is often referred to as India’s “cave capital” with 1,350 caves identified and 850 explored so far.